Many were repeated by teachers, however the ones most mentioned in some way were motivation and effort. Personally I agree wholeheartedly with motivation and effort. They are key to ensuring our students are the ‘best’ they can be. Without them in our subject there is very little chance of progress and learning. Without them there is very little chance our students will stay fit and healthy for life. If a teacher can create an environment where students are motivated and put in effort, then there is a very good chance of success (that being for me some form of improvement). Motivating a child, especially in a subject like PE can be problematic, and should be a area of real thought and development for us as practitioners. This I would imagine is why many teachers, myself included, would instinctively think of our ‘best’ students as intrinsically motivated. It makes them very easy to teach as they engage in everything and anything we deliver for them. In The Educational Benefits claimed for Physical Education and School Sport: An Academic review, it suggests that Physical Education and School Sport offers 4 areas of benefits to the participant. They are physical, social, affective and cognitive benefits. These in turn can become individual learning domains. (Physical Literacy has three learning domains; physical, affective and cognitive. Whilst I am growing in my advocacy for Physical Literacy, I do prefer having the social element being drawn as a learning domain in its own right, even though this can be hugely context dependent). 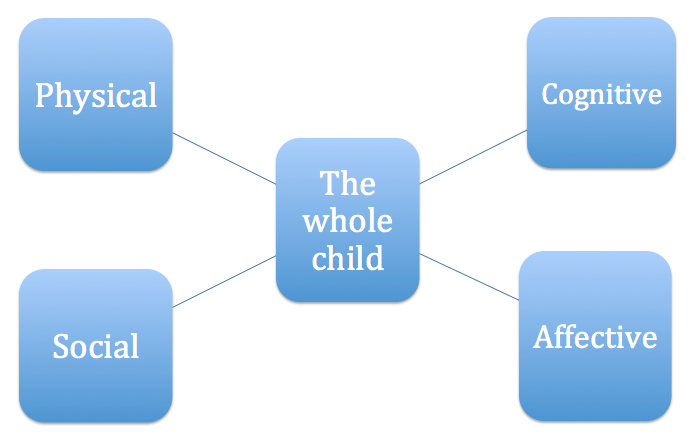 Learning in these four domains can contribute to the development of the whole child. A holistic approach to PE that I try to aspire to with my provision. The physical domain would include physical competency, fundamental motor skills, health and skill related fitness, technique and psychomotor skills. The social domain would include leadership, working with peers, treating others with sensitivity, playing by the rules and communication. The affective domain would be motivation, confidence, self-esteem and engagement. The cognitive domain would be knowledge and understanding of healthy and active lifestyles, awareness of rules and tactics, feedback and reflection and understanding how to perform. This to me is striking. A subject that is uniquely defined by its physical nature doesn’t define its best students in this way. Where is the physical competence? Where is the skilful mover? Where is the athletic student? I’m not talking about being elite here, but having students that that are confident and competent movers in purposeful physical activity, no matter what level that might be at. 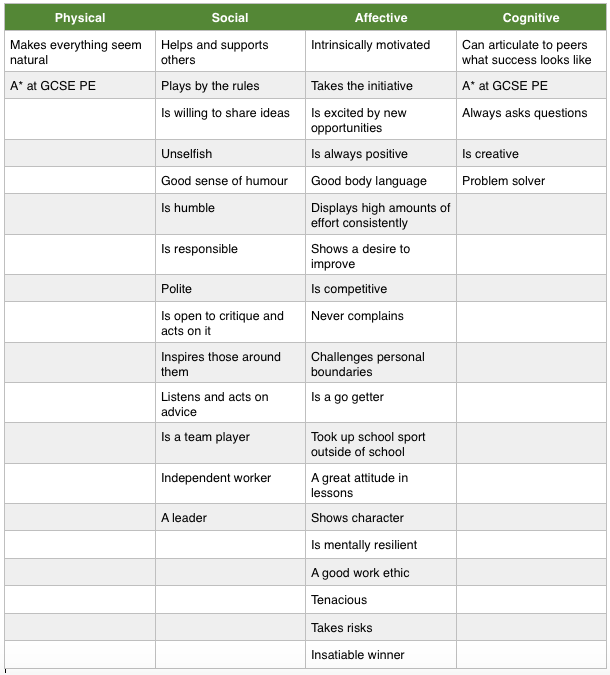 Have we forgotten what PE is about? Have we become so worried that a student might fail, or find something difficult, that our expectations on the physical learning domain have disappeared? Being able to play football, is not the same being able to move confidently. Being able to play rugby, is not the same as being able to hold your own body weight. Being able to finish the cross country course, is not the same being able to run properly. Surely our best students can run, and jump, and skip, and climb and move. They need function, before they play sport. As I stated previously, yes we must create an environment that encourages improvement in the affective learning domain. It may be the most important thing we can do without doubt. But we create that environment so pupils themselves can become intrinsically motivated to move, so they learn to move, that they learn through movement, that they learn about movement and that they become confident movers for a lifetime. If and when we talk about our ‘best’ students within PE, we don’t mention the confidence and competence of their basic functional movement, then what does this say about our weaker students? Surely basic functional movement should be a non-negotiable for all? Each year these basics reduce in the students that come to us from primary school. The 6 weeks block of sports that have been a staple diet for many secondary schools may no longer be fit for purpose, if it isn’t creating functional confident movers. It is with this in mind when I look to plan and develop our provision for the future. I really like your point about the identified characteristics of best students in PE not including physical ability. My thought when I looked at the chart of the characteristics by domain was that those characteristics would likely be present in students who were good students at anything. Could it be that a student who is good in PE is just generally a good student? Agreed. I had a similar thought. Apart from a couple, it is pretty generic bank of statements that could be applied to any subject. My personal experience that those who tend to be very good academically, struggle in PE. There are always the exceptions. This is probably heavily due to the context of my school though and the type of child we have. There has been some research that development in certain areas is context specific. So developing character through sport does not necessarily translate to other areas of that individuals life. I holehartedly agree with your statement that students coming into secondary school from year 6 are possessing every decreasing amounts of physical literacy abilities. Is this a legacy from the cutting of the SSCOs? I believe so. I do believe the SSCOs in my area were consistently effective. The variety of provision now seems much greater than before. I still believe that trained primary PE specialists in every primary school in the country, who have a deep understanding of how children learn motor skills would have the biggest benefit. However unless parents get involved and support PE as well, by encouraging regular physical play outside of school, then we will continue to fail our pupils physical development. I feel like my brain needs time to process. So I want to say something now but will come back again no doubt. What is the purpose of PE? Dominique has just posted what the IB have decided PE is about and what it isn’t and it strikes me in the same way that you have eloquently written here – where is the focus on movement? I am guilty of putting too much time into the ‘other’ important parts of PE this year – student leadership and self advocation, team building, knowledge and planning/designing games and reflecting and setting goals… but my reflection on all of this is that I have swung too far away from the movement and motion – I have had PD all about visible thinking and assessment but what I need to do now is spend some time learning in more depth about sports that aren’t mine – I run, I play invasion games, I swim and I cycle and do gymnastics – but I need to now set focus not just on how to teach but the skilful motion of movement in these conceptual learning units – what makes an effective runner? How do you defend effectively? What is the difference between invasion games and net games? How do you set up a play over 6-touches in Touch Rugby? Will that work in another game? I need to know more about these topics as I teach High School PE and I want to ensure that the other important parts are coming through here too – but that the motion and movement is not lost in the quest for other things. PE was not always my fave subject as a child. I hated many of my PE teachers but my G7 PE teacher and running coach was a fabulous role model who wanted me to discover what my body could do in motion – and it is this that I want to extend to my students – when you find the motion/game/exercise that inspires you – your body and mind come together to do amazing things – some days it hurts, some days you are too tried, but when it is all working – what a life you can lead. Thank you for making me think and reflect tonight. Lots more thinking and writing to see where this will take me next. I would love to sit in your Dept meetings – they seem to me to be very vibrant. Some more learning for me. I particularly like this point around the need to include the social domain within the core outcomes of physical education. For me, this is a key aspect of preparing people to engage with the physically active life and from my work exploring Cooperative Learning, Ash Casey and I found that when students develop their social skills, learning in physical, cognitive, and affective domains is advanced. Certainly with your key aims identified as motivation and engagement, social skill development acted to drive motivation and engagement. Perhaps a limitation of physical literacy, but as this concept becomes further understood in practice we might begin to see how physical literacy as a pedagogical practice caters for social learning. Will be writing assessments this summer. Hoping to shake things up a bit with my classes! 1. The now decade-long focus on assessment and accountability which seems to value specific performance traits beyond the essential motor skills. I’ve sometimes compared the assessment criteria used in PE practical assessments that I have seen or been part of to a classroom teacher asking a student a question such as “What am I thinking?”. In such scenarios it can become a coincidence of time and space that someone succeeds rather than a coherent structure of building and mastering core performance skills which, if followed and persevered with, produces mastery. 2. Schopenhauer beautifully described how a human being will be 99.9% perfectly healthy but will focus deeply on the acute pain & suffering that has been caused by hitting one’s thumb with a hammer. Our tendency, probably through learning, is to value the immediate and obvious and to ignore the subtle and nuanced especially if we are over-worked, anxious or fearful. Therefore when we judge students we might be in danger of starting with what we fear most in student behaviour. Lack of effort & perseverance means underperformance of a learner in an academic sense and therefore is the very behaviour that we want to eradicate. Is it this which is coming through in the feedback you received? I read and hear this kind of statement very often in education circles but in wider society too. What do we mean by this? Are we suggesting that there is some kind of personal best that each student has? Is this what we mean when we use the term “ability” or “talent”? Is, in fact, the educational system not a talent model by design, allowing a fixed seat-time meaning that those with most opportunity, provision and esteem achieve most? I utterly reject these ideas as facts or even “facts of life (it should really be facts of society)”. I am mot qualified to say that there is no such thing as ability or talent but I have never, ever seen any personal evidence of it. I have never met a “gifted” person in my life who did not have a story that could broadly explain their precociousness. When I have this conversation with colleagues they normally say things like “It’s just the way it is.” or “what about Mozart – he was composing sonatas by the age of 5. There must be talent”. I will answer both these points. Firstly it is just the way it is because we as a profession roll over and let it be thus. We are the most powerful people in our society because we can change it! Secondly most people have ignored Mozart’s father. Leopold Mozart is widely considered to be the greatest music teacher of his day and the “Father” of modern music teaching techniques. What do we imagine Mozart’s early life was like? Did he see the piano in isolation from his father and just connect with his gift or did his dad sit him there for hours and days and systematically make him a great musician? Incidentally Mozart hated his father to the core. I wonder why. Recently I was at a table tennis practice and a nice fellow came over to me while I was watching my elder daughter (8 years old) dismantle the game of an experienced adult league player. This man said to me “When did you realise your daughter was gifted?”. I smiled and said something mundane but inside I was offended. I thought to myself “If you knew what it took to get to that level you wouldn’t ask questions like that”. Later that day I thought about how many table tennis balls she had hit, under pressure, by the age of eight and I realised it was in the region of 50-75k. Is this talent or is this provision and opportunity? Is she being the best she can be or the best her society, environment and role models allow her to be? If the answer is the latter we need serious change in our society. Your use of this term is normal and in context. Go and read any welcome comment from any head teacher on any school/college website – they all the say the same type of thing (I originally used a different word instead of “thing”) – “…to reach their potential…”. Let’s change this. what about “…reach our potential..”? Or “…reach human potential…”? By unravelling the talent myth we can change society. I teach Grade 3 and spend a lot of time in PE teaching locomotor skills and FMS – I am amazed at the lack of skills and endurance students have when they start the year. Many of the students who are active do not have effective basic skills in most activities. 2.”my child isn’t a great soccer player, how is he getting a ‘B’? (has effective FMS, consistent effort, problem solver). Hi Deb. Thanks for sharing your practice. I agree with you that at the heart of PE is the developed of actual and perceived movement competence. We must as PE teachers make this our main focus. Developing competence is the best thing we can do to develop confidence in our students, they are inextricably linked. However I do feel that the other areas I mentioned (cognitive, social and affective) have an impact on the cognitive. If we do not explicitly teach children in our subject social responsibility and the skills that come with that, such as listening, communicating clearly and supportive behaviours we do not create a climate for students to ‘have a go’. i think some teachers might see the social, cognitive and affective learning domains replacing the physical domain. For me the physical domain is the key one and learning and improvement in the others is to help support the development of motor learning. I’m a primary school PE teacher, formerly class teacher, teaching from nursery up to Year 6. This is fascinating and, assuming I’m understanding correctly, are you saying that perhaps at primary schools, we need to be focusing almost entirely on the physical domain? Our role is to encourage all children to lead healthy and active lives, so clearly they will need the physical skills. A smattering of skills in the other 3 domains (especially in the affective domain for resilience and grit) may help them engage in team sports. Now I don’t have any statistics to prove this, but I would imagine that the majority of adults who take physical activity do so in a non team competitive environment, so would largely be using skills from the physical domain. So perhaps we have this all back to front and are taking our eye off the main objective of skills in the physical domain? Hi Anthony. What is this in relation to?